Here at James Island on November 14, 1782, Tadeusz Kościuszko, Colonel of the Continental Army, led the last known armed action of the Revolutionary War against the British and was nearly killed. Later, The Continental Congress named Kosciuszko Brigadier General for his service in both the North, including his tremendous assistance to General Gates at The Battle of Saratoga and brilliant efforts assisting General Greene in saving the South Region Army from Cornwallis forces and ultimately severely weakening the British under command of Cornwallis. Long settled as a semi-rural area, this island has been affected by increasing urbanization and the expansion of the city of Charleston. Island residents incorporated the Town of James Island on January 8, 1993. Joan Sooy was elected as the first Mayor in March 1993. A lawsuit was filed by the City of Charleston claiming that the parts of the new Town were not contiguous, being separated by salt marsh that it had already incorporated. The City of Charleston prevailed at Circuit Court and the Town appealed. The South Carolina Supreme Court ruled against the Town in 1997. 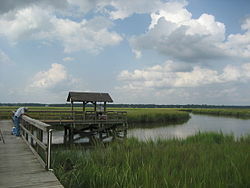 The South Carolina legislature changed incorporation law to allow incorporation over already annexed salt marsh. The Town of James Island was incorporated a second time in 2002. Mary Clark was elected Mayor. The City of Charleston challenged the Town again, this time arguing that the new incorporation law was unconstitutional special legislation. The City of Charleston prevailed in Circuit Court and the Town of James Island appealed. The South Carolina Supreme Court ruled that the singling out "salt marsh" was irrational, the legislation was ruled unconstitutional and the Town was closed for a second time. South Carolina changed the state laws affecting incorporation, effective on July 1, 2005. A third attempt to become a town was successful in June 2006, when about 3,000 voted to incorporate. The day after the vote, Charleston mayor Joseph P. Riley, Jr. filed a lawsuit against the town for the third time, saying that it was unconstitutional. Mary Clark was elected mayor of the town for the third time in August 2006. On November 7, 2008 the City of Charleston lost its lawsuit against the Town of James Island in Circuit Court. In an election on August 3, 2010, incumbent Clark lost to Bill Woolsey, an economics professor from The Citadel and member of the James Island Town Council from 2002-2004. The South Carolina Supreme Court ruled against the Town of James Island in June 2011. It ruled that the South Carolina incorporation law used by the Town was constitutional, but that approximately 25% of the Town was not contiguous. Rather than remove that portion of the Town, it ordered the Town closed. The Town was incorporated a fourth time after a referendum on April 24, 2012. The City of Charleston determined that it could not successfully challenge the Town by May and the deadline for a challenge passed on July 17. Former Mayor Bill Woolsey led the incorporation effort and was unopposed in the election held on July 31, 2012. He was subsequently re-elected July 29, 2014. The town limits have never incorporated the entire island of James Island, as the City of Charleston has annexed land on James Island before the original incorporation of the town and between subsequent re-incorporations. There were approximately 18,000 residents in what were the town boundaries and approximately 20,000 in Charleston's city limits as of the 2010 US Census. The Town currently includes a population of 11,500. Approximately 6,000 residents remain in unincorporated Charleston county, and 20,000 in the City of Charleston. James Island is the home of many historical events and areas. McLeod Plantation, a former Sea Island cotton plantation, was recently sold by Historic Charleston Foundation to the Charleston County Parks and Recreation Commission. Ft. Johnson is reported to be the site of the first shot of the Civil War. The remains of Ft. Lamar are nearby. Recent renovations of historical places include the Seashore Farmer's Lodge on Sol Legare Road. The Fort Johnson/Powder Magazine, Fort Pemberton, Lighthouse Point Shell Ring (38CH12), Marshlands Plantation House, Seashore Farmers' Lodge No. 767, and Unnamed Battery No. 1 are listed on the National Register of Historic Places. Date regarding cost of living and property values is taken from the City-data website and the Charleston County Sheriffs Office incident report. This in no way reveals the amount of crime on the Island as it does not include the City of Charlestons Crime Report. The town of James Island is served by the Charleston International Airport. It is located in the City of North Charleston and is about 12 miles (20 km) northwest of James Island. It is the busiest passenger airport in South Carolina (IATA: CHS, ICAO: KCHS). The airport shares runways with the adjacent Charleston Air Force Base. Charleston Executive Airport is a smaller airport located in the John's Island section of the city of Charleston and is used by noncommercial aircraft. Both airports are owned and operated by the Charleston County Aviation Authority. One of James Island's oldest neighborhoods, Riverland Terrace, was developed in the 1940s, but it is not actually in the Town of James Island. More upscale neighborhoods in the town include White Point Estates, Stiles Point Plantation, Eastwood, Harborwoods, Seaside Plantation and Parrot Creek. ^ "Bill Woolsey". Libertarian Party. Retrieved 2014-08-09. ^ "Stephen Colbert donates ATV to Charleston turtle nesting program". WBTV. July 2, 2010. Retrieved May 18, 2014. ^ McClure, Vaughn (May 17, 2014). "Roddy White's brother shot dead". ESPN.com. Retrieved May 18, 2014. ^ "World knew him as Porgy-he died a beggar". The Tuscaloosa News. Google News. December 24, 1989. Retrieved May 18, 2014. ^ "Stormin' Thomas reconnects with Lowcountry roots, Citadel baseball". WCIV. February 18, 2013. Retrieved May 18, 2014. ^ Mehring, Chris (March 4, 2014). "Gorman Thomas is special guest for 2014 Leadoff Experience". Minor League Baseball. Retrieved May 18, 2014. This page was last edited on 31 March 2019, at 05:05 (UTC).